In May 2011 a devastating tornado hit Joplin, Missouri, killing 158 people and injuring 1,150 others. Many of the victims were children. How can we make sense of such loss? How can we explain such tragedies to our own children? Gust is a graphic novel that tells the story of a small group of middle schoolers caught up in the winds of the tornado who must find a way to build a new life out of the wreckage. 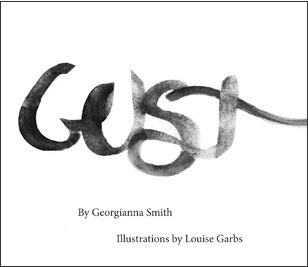 Written by Georgianna Smith, whose family hails from Joplin, the book is illustrated by the windswept watercolors of Louise Garbs, another Missouri native who has spent her childhood in the Midwest’s tornado alley. This book is inspired in part by Gust, a modern dance conceived and choreographed by Ashley Miller and Julie Moellenakamp, then performed by students at the University of Central Missouri. Literature, painting, dance – when we are confronted with forces larger than we can understand, Gust shows how we can turn to art for comfort. Pleiades Press, housed at the University of Central Missouri, has been publishing works of poetry, fiction and translations for fifteen years. Thanks to a generous grant from the Mid-American Arts Alliance, we are pleased to be publishing this first work of illustrated young adult literature, which will be widely available for sale and also be distributed free of charge to schools in tornado-affected regions.